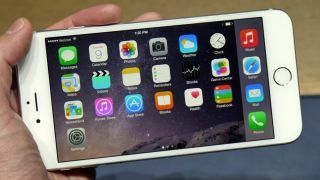 Techradar has once again teamed up with online smartphone retailer Mobiles.co.uk to bring you two new amazing and exclusive deals on the iPhone 6 and iPhone 6 Plus. Using the voucher codes on this page you can save yourself up to £54.99 on the upfront cost of one of Apple's smartphones, leaving behind two of the UK's best phone deals. We believe what we've negotiated for you here are the best iPhone deals in the UK right now - with 10GB of data and a free iPhone 6 or 6 Plus for as little as £39 per month. This is an exclusive deal just for TechRadar readers! Use the discount code TECHRADAR45 at the checkout and you can get a £44.99 discount on the iPhone 6. So instead of paying £44.99 upfront, you get the iPhone 6 for free with 10GB data, unlimited everything else for just £39 per month. You won't find a better deal on data than that - don't forget to use the discount code. This really is a fantastic deal on the 16GB version of the iPhone 6 Plus and we've negotiated it exclusively for TechRadar readers. Use the discount code TECHRADAR55 at the checkout and you'll get the phone for FREE instead of having to pay the £54.99 up front fee.